UNFORTUNATELY THE DVD IS NOT AVAILABLE AT THE MOMENT! Sailing knots are a fundamental part of a sailing course and of the skipper exam, because on a boat there is always a line that has to be tied somewhere. Or lines have to be tied to each other. For every situation there is a perfectly secure knot, one that is easy to tie and easy to loosen. 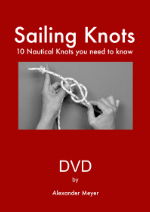 On this DVD the most important sailor’s knots are explained step by step. 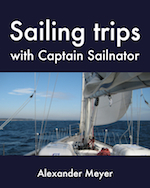 This is the optimal preparation for your sailing course and the skipper exam. 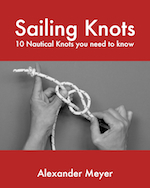 The following 10 knots are explained in 12 Videos: Figure-eight Knot (01.39 min), Square Knot (02:13 min), Bowline Knot (03.27 min), Cleat Knot (02:49 min), Clove Hitch (02:51 min), Clove Hitch | laid (02:08 min), Clove Hitch | thrown (02:11 min), Sheet Bend (03:05 min), Double Sheet Bend (03:00 min), Round Turn and two half Hitches (03:54 min), Rolling Hitch (03:05 min), Cleat with Bowline Knot (01:40 min). Total playing time of the DVD is: 32:00 minutes. 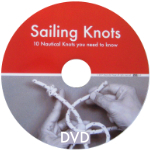 It is recommended to also order the booklet „Sailing Knots“ by Alexander Meyer which is a very useful addition to the DVD! The DVD is available on amazon.com→. Customers from other countries should be able to log in with their local amazon-account! 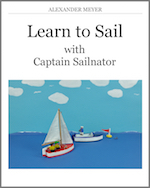 Save shipping costs and make a collective order for all your comrades in your sailing course and don’t forget to add the booklet “Sailing Knots” to your order! This way it is easier to reach the minimum amount for free shipping! Sailing Schools who order the DVD for their customers are allowed to show the videos during their lessons. The resale price for the DVD is up to you!! !